Here's a little video update that Ben & Anisha did for their church in England. Albert says . . . This is the sign on the front door of a little Mexican restaurant that Brenda and I ate at. We were on the east side of Houston and were having trouble finding a place to eat. This place was busy, so we thought we'd give it a try. The sign should have been ample warning NOT to eat hear. We both agree, this place had the WORST food we had eaten in a long, long, long, long, long, long, time. 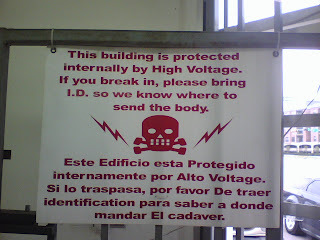 So, when the place of business says they are going to kill you . . . maybe you don't want to eat there.